Suction Cups for retail purposes are essential devices for hanging and displaying signage, Clip Strip® Brand Merchandisers or many other Point of Purchase materials. Signs and Merchandising Strips can be hung from windows, glass, refrigerator doors, freezer doors or cooler doors at convenience stores, liquor stores, dollar stores, supermarkets, mass merchants, big box, or drug stores, etc. using any of our suction cup sign holders. They are easy to use on any smooth, no-porous surface and do not leave a residue. 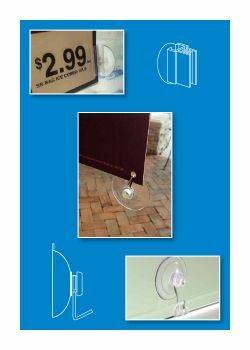 Count on us for your glass or window suction cup sign holder point of sale materials at retail! Brands and Retailers count on us for a vast array of sign holders, please browse our main section to find other tools we carry to help you "sell more at retail." 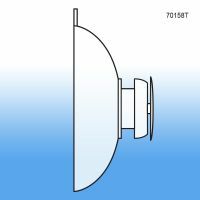 Minimum quantity for "Suction Cup - Plain with Mushroom Head, 1 ¾", 70158" is 100. Has Hook to Hang a Sign From Window/Glass. 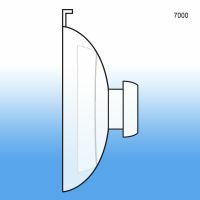 Minimum quantity for "Suction Cup Sign Holder - with Hook, 70158H" is 100. Minimum quantity for "Grip-Tite™ Suction Cup Flush Mount Sign Holder, EG-23" is 50. 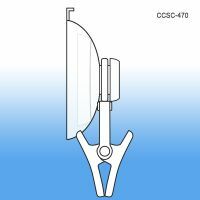 Minimum quantity for "Clever Clip Suction Cup, CCSC-470" is 25. 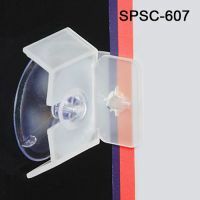 Minimum quantity for "Super Sucker Suction Cup, 7000" is 100. 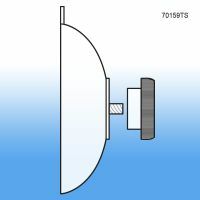 Minimum quantity for "Super Sucker Suction Cup with Hook, 7000PH" is 100.